Crown Prince of Dubai and Chairman of Shabab Al Ahli Club H.H. 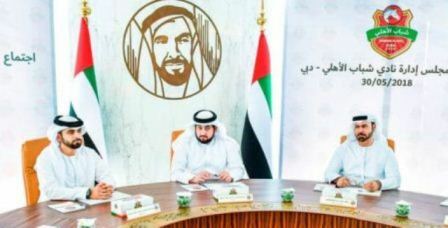 Sheikh Hamdan bin Mohammed bin Rashid Al Maktoum has issued a decision forming the board of directors of Shabab Al Ahli Football Club under the chairmanship of H.H. Mansour bin Mohammed bin Rashid Al Maktoum. The decision was made based on the recommendation of the Chairman of Board of Directors of the Club H.H. Sheikh Ahmed bin Mohammed bin Rashid Al Maktoum, during the board of directors meeting held today at Emirates Towers. As per the decision, the board members of Shabab Al Ahli Club includes Sami bin Dhaain Al Qamzi, Ibrahim Abdulmalik Mohammed, Khalid Bouhmaid, Yaqoob bin Essa bin Nasser Al Sarkal, Ali Alhabawi, Abdulmajid Hussein, Saeed Rashid Al Hali and Jamal Zaal AlMuhairi. Sheikh Hamdan, also Chairman of the Dubai Sports Council, has issued a decision naming Essam Al Humaidan as board member. H.H. Sheikh Hamdan also issued a decision to set a new section in charge of collective and individual sports at the Club, under the name of "Sports Section" to be managed by a board of directors and to enjoy an independent financial and organisational structure. The sports section’s board will be chaired by Mohammed Ahmed Almarri. In addition, Sheikh Hamdan also named Hisham Al Qasim as chairman of "Dubai Assets Management Establishment" which is in charge of managing and investing in all assets of the Club. These decisions are effective from the date of issuance. Sheikh Hamdan expressed his best wishes for the various entities of the Club, and praised the efforts of the board of directors. During the meeting, chaired by H.H. Ahmed bin Mohammed, the board of directors of Shabab Al Ahli Club reviewed a report about the merger of sports clubs in Dubai, along with the financial report of the Club since establishment. The board also reviewed a report by Dubai Assets Management Establishment" about the various assets of the Club, and its future plans.